Walk up to a friend at the gym. He’s working out on a machine. He has his headphones in. And that’s how you take a joke like a boss. *Commentary: He actually didn’t hear me at all. His response was a quick-witted joke. 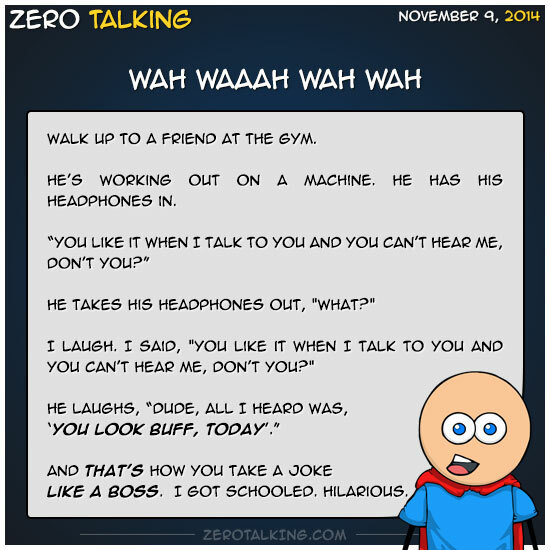 As-in, that’s all he ever hears anytime he can’t hear what someone at the gym is saying to him. I.e. I can’t hear them, they must be saying I look buff today.